Moog Moogerfooger MF-108M Cluster Flux Review - Best Analog Modulation Pedal? Moog Moogerfooger MF-108M Cluster Flux Review – Best Analog Modulation Pedal? Moog really has a way of going all out with their Moogerfooger line. The attention to detail and amount of features packed in these guitar pedals are always second to none, soaring above and beyond other offerings on the market. Everything from the construction and control knob placement to the obsessive choice of internal components seems painstakingly mulled over to create a product of the utmost quality and functionality. The Moogerfooger MF-108M Cluster Flux is certainly no exception. The MF-108M is essentially a chorus, flange, and vibrato unit with an abundance of control parameters for shaping surreal soundscapes and mangling your sound beyond recognition should you so desire. The Cluster Flux uses a pair of rare Panasonic Bucket Brigade Delay chips, chosen for their specific tonal character, in its all-analog delay lines to induce the lush effects the MF-108M has on tap. Its various parameters can be tweaked in realtime with the surface control knobs or via the assortment of expression pedal inputs on the back. And that’s not to mention full MIDI implementation for controlling everything imaginable on the surface and under the hood. The MF-108M is an instrument of the highest order, a tool for sonic pioneers like the man whose name this pedal bares. Let’s get ourselves into a Cluster Flux to find out if it’s the best chorus/flanger/vibrato pedal around. But first, let’s fun down the features before diving into our Moog Moogerfooger MF-108M Cluster Flux review. Utilizes 2 rare Panasonic Bucket Brigade Delay chips. Control knobs for Delay Time, Delay Feedback, LFO Waveform Selection, LFO Rate, LFO Amount, Drive, Output Level, and Mix. 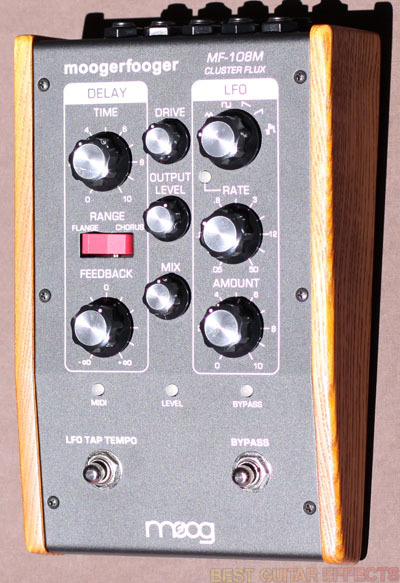 Delay Range switch adjusts between Flange and Chorus effects. Tap Tempo for controlling LFO Rate. ¼” jacks for Audio In, L/Mono Out, R Out, FB Insert. ¼” Expression Inputs for Feedback, Time, LFO Rate, LFO AMT, and Mix. MIDI Input for controlling all parameters via MIDI. Powered by included 9VDC 400mA adapter. 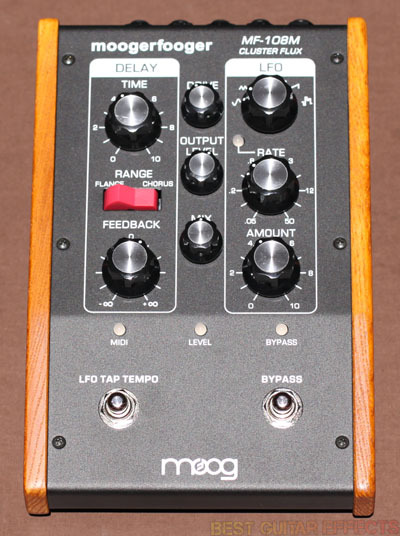 Visit Moog for more info about the Moogerfooger MF-104M Cluster Flux. Like many Moogerfoogers, the Cluster Flux might appear overwhelming and intimidating at first. But once you become familiar with the functionality of the pedal and how the various control knobs interact, you’ll be able to conjure up your desired sounds with ease. To start I adjusted the Drive and Output Level knobs to taste, typically with the Drive pulled back around 10 or 11 o’clock and the Output Level in the 1 to 2 o’clock range, and set the Mix knob at noon. I selected a Sine Wave and set the Time and Feedback to noon and the Rate and Amount to 11 o’clock. I engaged the Cluster Flux in the Chorus switch position. Settings in this range produce typical classic-style chorusing sounds yet with more room for tweaking than most chorus effect provide. It’s worth adjusting the Time knob from this position to get a feel for the tonal characteristics of the MF-108M. There are plenty of subtle and very usable variations to be discovered by even the small twist of any knob. I find the Cluster Flux to be particularly pleasing when producing smooth and rich chorusing sounds. There’s a level of aural beauty that few other pedals and hope to contend with. Going from Chorus to Vibrato is easy. Just turn the mix knob all the way clockwise. Then push the Rate up a little past noon and bring the Amount to around 11 o’clock or so. Now you’re just hearing the pitch modulated wet signal. The Cluster Flux produces gorgeous, pulsing vibrato sounds courtesy of its Bucket Brigade Delay signal path. The LFO of the MF-108M also allows you to achieve a level of modulation customization that no other analog Chorus/Vibrato pedal can match. It’ll do a gentle pitch warble all the way to the most extreme “boingy” sounds and can decimate your sound beyond recognition. Ready to go jet-set? Flip on the Flange, set in a Triangle Wave, roll the Feedback and Amount up towards 3 o’clock, and pull the Rate down for some great classic Flanging. I really like setting the Rate in the 9 o’clock area for that really slow airplane-taking-off Flanging effect. The MF-108M covers all your Flange, Chorus, and Vibrato needs exceptionally well. And I really must say, the Cluster Flux produces what might quite possibly be the best flanging I’ve ever heard. I also really enjoy controling the Flange effect in real-time with an expression pedal connected to the Time control input. At this point I have to bring up the Tap Tempo. I typically find myself using most Chorus/Vibrato/Flanger pedals at lower rates to bring less attention to the out-of-time rhythmic contrast. The Cluster Flux allows you to tap-in precise modulation rates for timed movement and rhythmic precision that’s unrivaled in the world of analog Chorus, Vibrato, and Flange pedals. And of course you can keep to the beat with MIDI, also. The depth of control you have with the MF-108M as a stage or studio tool is an absolute necessity for the most demanding musicians and producers. Aside from all the standard modulation fare (it’s anything but standard with the Cluster Flux, really), it’s worth exploring the extremities of the control parameters to see what kind of truly unique soundscapes you can discover. Just turn any knob towards its extreme position, and things will get weird pretty quickly. I recommend testing out various LFO settings such as the Square Wave, Ramp Up, and Damp Down while getting wild with the Rate knob. If you want to balance the chaos with order, use the Mix knob to let your dry signal rise up from the abyss. Add in an expression pedal or two, and you can take your music to the ends of the universe and back again. The MF-108M offers extreme analog modulation possibilities that will be appreciated by the most adventurous sonic architects and those with a mad-scientist tick. 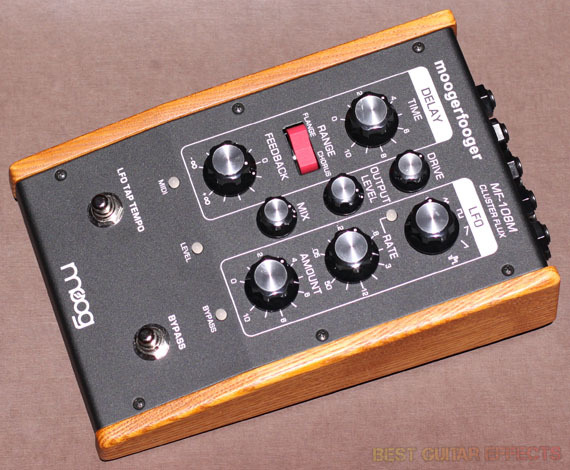 It’s great to see that Moog continues to make pedals of uncompromising high quality. Their MF-104M Analog Delay is another example of this level of craftsmanship. The Cluster Flux certainly carries on Bob Moog’s legacy in the best possible way. None of the features of this pedal seem tacked on. While you can venture off into perhaps unusable territory by pushing this pedal in some extremes, once you get a grasp for how the controls interact, you’ll conjure up masterfully crafted modulation sounds with ease. This is one Cluster Flux you should definitely get yourself into. Let’s see the final result. The Moog Moogerfooger MF-108M Cluster Flux is one of the most ambitious and all encompassing modulation pedals ever devised, offering a multitude of all-analog chorus, vibrato, and flange effects. The level of control and sound design possibilities contained within the MF-108M goes above and beyond another other analog modulation pedal around. If you want the widest range of analog modulation sounds from a single unit, the Cluster Flux may be your ultimate stage and studio tool. If you’re looking for the best chorus/flanger/vibrato pedal, it simply doesn’t get much better than the Moog MF-108M Cluster Flux. That concludes our Moog Moogerfooger MF-108M Cluster Flux review. Thanks for reading. Want to buy the Moog MF-108M Cluster Flux?